Unique Stylish Purses | Miche Bags: Miche Purse Sale! Sophisticated Lynn Classic Shell Feminine Textile Floral Panel. 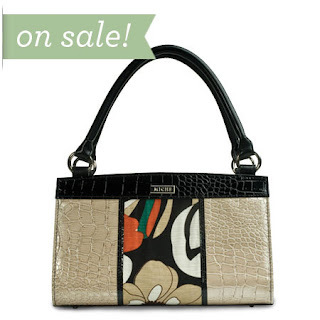 Miche Purse Sale! Sophisticated Lynn Classic Shell Feminine Textile Floral Panel. For those days when you're feeling uptown and sophisticated, slip on the Miche Lynn Classic Shell and you're ready for whatever you have planned. Maybe it's lunch with your favorite girlfriends. Perhaps it's time for that most favorite of womanly pastimes shoe shopping! Lynn's metallic cream croc faux leather, black faux accents and ultra-feminine textile floral panel are as ready as you are to face the day with style and panache.